The present monarch is King Harald V, who has reigned since 17 January 1991, succeeding his father, Olav V. The heir apparent is his only son, Crown Prince Haakon. The crown prince undertakes various public ceremonial functions, as does the king's wife, Queen Sonja. The crown prince also acts as regent in the king's absence. There are several other members of the Royal Family, including the king's daughter, grandchildren and sister. Since the dissolution of the union between Norway and Sweden and the subsequent election of a Danish prince as King Haakon VII in 1905, the reigning royal house of Norway has been a branch of the Schleswig-Holstein-Sonderburg-Glücksburg branch of the House of Oldenburg; originally from Schleswig-Holstein in Germany, the same royal house as the Danish and former Greek royal families. Norway had been brought along into the new developments of the world[clarification needed] as they arrived in Denmark. However, with the break the Norwegians were able to forge a more progressive political development than was the case in Denmark. Denmark introduced a constitutional monarchy 35 years after Norway. 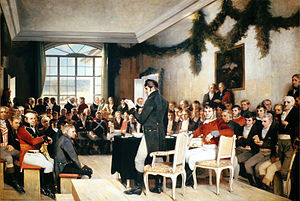 Parliamentarism was introduced in Norway 17 years before Denmark and 33 years before Sweden. The union with Denmark also had its adverse effects on the monarchy: among other things it resulted in the Crown of Norway losing territory which today amounts to 2 322 755 km² (although most of this was uninhabited areas of Greenland). Very little royal activity had been relocated to Norway; the country thus lacks the monumental palaces of the period which can be seen in Copenhagen and other parts of Denmark. The union was nevertheless marked by the Norwegians' constant and growing discontent with being in a union of any kind. The Storting would propose laws to reduce the king's power or to assert Norwegian independence. These would most often be vetoed by the king, but as he only had the power to veto the same law twice, it would eventually be passed. The constitution of 1814 already specified that Norway would have a separate flag, and the present design was introduced in 1821. The flags of both kingdoms were defaced with the union mark in 1844 to denote their equal status within the union. Despite royal objections, this was removed from the Norwegian flag in 1898. In 1837 local self-government in certain areas of policy was introduced in rural areas as well as towns . A Parliamentary system was introduced in 1884 . One important incident in the early years of the new monarchy was in 1928 when the King appointed the first Labour government. The Norwegian Labour Party was at that time quite radical and even had the abolition of monarchy as part of their programme. It was the custom for the King to rely on the advice of the previous Prime Minister in deciding whom to give the assignment as new Prime Minister. In this case the previous conservative Prime Minister was opposed to giving power to the radicals and advised the appointment of someone else. But the King adhered to the established practice of parliamentarism and decided to appoint Christopher Hornsrud the first Labour Prime Minister. The Labour party later dropped the abolition of monarchy from their programme. Although the 1814 constitution grants important executive powers to the King, these are almost always exercised by the Council of State in the name of the King. Contemporary Norwegian constitutional practice has replaced the meaning of the word "king" in most articles from the meaning the King-in-person; apart from those dealing with the monarchy specifically, as opposed to those dealing with the apparatus of government and affairs of state at large; to the cabinet of the Prime Minister (also known as the King-in-Council when chaired by the King), which is accountable to the Storting, and thus ultimately to the electorate. Article 5 stated: The King's person is sacred; he cannot be censured or accused. The responsibility rests with his Council. This article applies to the king personally. The king has legal sovereign immunity, though his status as sacred was dissolved on 8 May 2018. The King has to sign all laws in order for them to become valid. He can veto any law. However, if two separate Stortings approve the law, it becomes valid even without the King's consent. The Crown has not vetoed any law since the dissolution of the union with Sweden. The Church of Norway, also known as the Evangelical Lutheran Church of Norway, is the former state church of Norway, to which 86% of Norwegians are members. The Church of Norway professes the Lutheran branch of Christianity, and is a member of the Porvoo Communion. 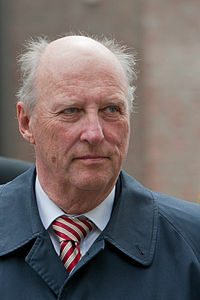 Until a constitutional amendment in 2012, the King was the supreme governor and protector of the Church of Norway. He formally decided who were to become bishops and oversaw that the church conducted its business according to "the norms prescribed" for them. In practice this authority had been delegated to the Ministry of Church Affairs. Since 2012 the Church has been self-governing, although it remains the established state church. In impeachment proceedings, the King cannot pardon a defendant without the consent of the Storting. From before recorded Norwegian history the monarch would be installed by acclamation, a ceremony held on the ting where the king swore to uphold the laws of the land and the assembled chieftains swore allegiance to him. 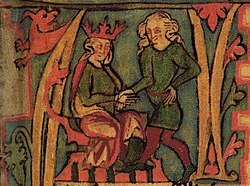 The first coronation in Norway and in all Scandinavia took place in Bergen in 1163 or 1164. For a long time both ceremonies were used in Norway. That way the king was invested with powers both from the noblemen and from the church. The coronations also symbolised that the king would hold the kingdom in fief to St. Olav the eternal king of Norway. The last acclamation took place on Akershus Castle in 1648. The last medieval coronation in Norway took place 29 July 1514. During the age of absolute monarchy (1660–1814), Norway's kings were crowned in Copenhagen, using the Throne Chair. Today the king still goes through a ceremony similar to the acclamation when he takes the oath of allegiance to the Constitution in the Storting. The Norwegian Constitution of 1814 determined that any Norwegian coronations from that time onward were to take place in Nidaros Cathedral in Trondheim. This re-established the relationship to the sacred king's burial church. The constitutional article about the coronation was annulled in 1908. When king Olav V ascended the throne in 1957 he still wanted to receive the blessing of the church for his reign and the Benediction of the king was introduced. The benediction is a much simpler ceremony, but it still takes place in Nidaros Cathedral and with the Royal Regalia at the high altar. The regalia is currently located in the old Archbishop's Palace in Trondheim. King Harald V and Queen Sonja also received the benediction in 1991. The Constitution requires the new King to immediately take an oath before the Storting (or, if the Storting is not in session, before the Council of State and again before the Storting once it is in session). The oath is as follows: "I promise and swear that I will govern the Kingdom of Norway in accordance with its Constitution and Laws; so help me God, the Almighty and Omniscient." The order of succession to the Norwegian throne has followed absolute primogeniture since 1990, as is described in article 6 in the Constitution of Norway. Only people descended from the reigning monarch and the reigning monarch's siblings and their descendants are entitled to succeed to the throne. If the line of succession comes to an end then the Storting may elect a new king or queen. The royal family and the monarch have several residences at their disposal throughout the country. All of the official residences are partially open to the public. The Royal Palace in Oslo functions as the main official residence of the monarch. Built in the first half of the 19th century as the Norwegian residence of Norwegian and Swedish king Charles III (Carl Johan, Charles XIV of Sweden, reigned 1818-1844), it serves as the official residence of the present Norwegian Monarch. Gamlehaugen is a mansion and estate which functions as the monarchs residences in Bergen. Originally the home of Prime Minister Christian Michelsen, the estate became the royal family's residence in 1927. Stiftsgården in Trondheim is a large wooden townhouse which has been used by the royal family since the early eighteen-hundreds. The building has been the setting for the main festivities during coronations, benedictions and weddings which traditionally have taken place in the Nidaros Cathedral. Ledaal is a large manor house in Stavanger. The manor originally belonged to the influential Kielland family but has been the property of Stavanger Museum since 1936 and a became royal residence in 1949. Bygdøy Royal Estate, the official summer residence, is situated in Oslo. Bygdøy has been under extensive restoration and has therefore not been used regularly since the accession of King Harald V in 1991. The restoration was finalized in 2007 and has been frequently used by the royal family ever since. The Royal Lodge or Kongsseteren is located in Holmenkollen, and used by the Royal Family as a residence for Christmas and Holmenkollen Ski Festival each year. Oscarshall palace, a maison de plaisance, also situated in Oslo, but seldom used. The crown princely couple resides at Skaugum Manor in Asker municipality outside of Oslo, while the three princesses of Norway live on estates in Oslo, Fredrikstad and Rio de Janeiro, Brazil. Both Skaugum and Bygdøy Royal Estate are working farms producing grain, milk and meat; the profits are re-invested in the farms themselves. In 2004 the King transferred management of the farming activities on Bygdøy to the Norwegian Museum of Cultural History. Paléet. A magnificent townhouse which was as a royal residence between 1801 and 1849 prior to the construction of the Royal Palace. Bergenhus Fortress. Originally, the medieval castle was a residential palace while Sverresborg provided defence for the city. Tønsberg Fortress. The castle in Tønsberg was used as a residence by several kings, including Håkon V Magnusson who was the last king of Norway prior to the establishment of the Kalmar Union. Various Kongsgård estates were used by the Norwegian kings during the Viking age and early Middle Ages. This includes significant estates like Alrekstad, Avaldsnes Kongsgård estate and the Oslo Kongsgård estate. Until a constitutional amendment in 2012, functioned as the formal head or High Protector of the Church of Norway. ^ The introduction of parliamentarism is not as clear cut in Denmark and Sweden as in Norway. In Denmark the year 1901 is usually given, but the years 1905 and 1920 are also important in this respect. In Sweden a parliamentary system was reintroduced in 1917. ^ This number is found by adding up the areas of Jämtland, Härjedalen, Bohuslän, Iceland, the Faroe Islands, Greenland, Shetland and Orkney. The entire area of Greenland was not effectively controlled by anyone at the time; however it is today under the Crown of Denmark and therefore would have been under the Crown of Norway. ^ Gjerset, Knut (1915). History of the Norwegian People, Volumes II. The MacMillan Company. ^ Norgeshistorie.no, Om; Institutt for arkeologi, konservering og historie (IAKH) ved UiO. "1870–1914: industrialisering og demokrati - Norgeshistorie". www.norgeshistorie.no. ^ a b "Statsbudsjettet". www.statsbudsjettet.dep.no. Retrieved 1 May 2018. ^ "Statsbudsjettet". www.statsbudsjettet.dep.no. Archived from the original on 13 February 2010. Retrieved 1 May 2018. ^ "- Kongens formue under 100 mill". e24.no. Archived from the original on 19 May 2010. Retrieved 1 May 2018. ^ Brekke, Anders (2017-02-18). "8 av 10 vil beholde kongehuset: Størst oppslutning blant de unge". NRK (in Norwegian Bokmål). Retrieved 2019-01-28. ^ "Stadig flere vil beholde kongehuset". www.rb.no (in Norwegian). 2017-02-18. Retrieved 2019-01-28. ^ "Ja, vi elsker kongen!". www.vg.no (in Norwegian). Retrieved 2019-01-28.